Sadly, there's been an uptick in bicyclist deaths in recent years. Sharing the road with slower, smaller vehicles can sometimes be an annoyance, but there are strategies for driving on the road safely with traffic of the two-wheeled variety. Your powers of observation are the most valuable tool for keeping you and those around you safe on the road. Always be cautious making turns and come to a complete stop at a red light before making a turn. Never assume a way is clear, as it's easy to pass over bicyclists with a glance. 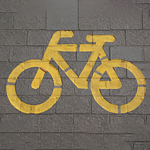 Check twice before changing lanes as well, as bicycles can easily be hidden in a blind spot. If you must pass a bicycle, make sure you leave at least three feet between your vehicle and them, proceeding slowly and cautiously around them. If you don't have three feet to spare, wait until you can safely pass by changing lanes. Be sure to stop by Ruxer Truck Center for a test drive of a vehicle or to get some pointers on sharing the road with bicycles.